Rachel Burttram stars in "Ugly Lies The Bone" at the Penobscot Theatre Company. Penobscot Theatre Company gives Lindsey Ferrentino’s play about healing from the wounds of war a compelling staging using technology more familiar to flat screens than the three-dimensional demands of theater sets. The large projected images of huge, snow-covered pine trees gives the audience the feeling they too are running on top of freshly fallen snow and tumbling down a hill that makes “Ugly Lies the Bone” such a very special theatrical experience at the historic Bangor Opera House. 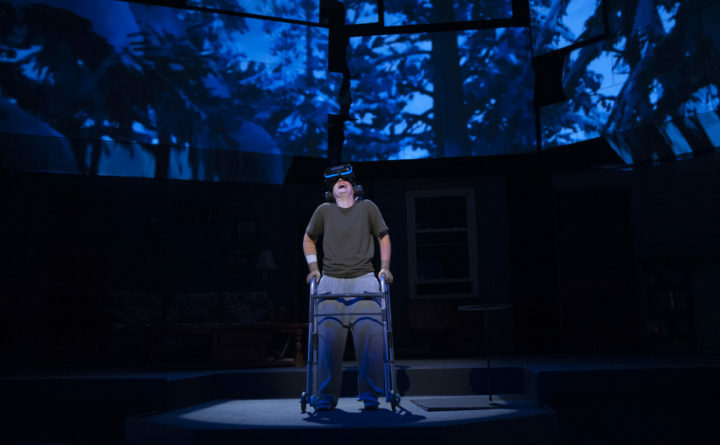 The play’s theme about a person’s ability to ever really come home is familiar but its execution and the use of video game technology allows theater goers to experience what the character does makes it feel like unchartered territory. The title of the play comes from an Albert Einstein quote — “Beauty is but skin deep, ugly lies the bone. Beauty dies and fades away, but ugly holds its own.” Ferrentino workshopped the show in 2014 and 2015 before its New York City premiere in 2015. “Ugly Lies the Bone” tells the story of Jess (Rachel Burttram), badly burned when an IED explodes beneath her during her third tour in Afghanistan. After 14 months in an Army hospital, she returns home to Florida to live with her sister (Amy Roeder). She reconnects with an old boyfriend (Brad LaBree) but much of her time is consumed by difficult physical therapy. To help distract her from the pain, Jess is given some virtual reality goggles and allowed to create a snow-covered world, narrated by a disembodied voice (Johanna-Karen Johannson), where the cold is a balm to her fiery skin grafts. Ferrentino has left out a lot Jess’ backstory. Instead of making her seem more like an “every soldier,” the lack of information leaves theatergoers wondering things like when and why she joined the military. Did she join in college or after? How exactly was she injured? What happened to the others in her unit? The answers to these questions aren’t essential to the story the playwright wants to tell but leaving them unanswered means they nibble on the edges of theatergoers’ minds, distracting them from Ferrentino’s broader themes about the ability of the injured and the damaged to recover. Bari Newport, PTC’s producing artistic director, directs the show with a loving yet light hand. She wisely chose not to overemphasize Jess’ scars. As of Saturday’s opening night performance, the five-member cast had not yet gelled into the tight ensemble Newport is known to foster. The emphasis on the technology needed to bring Jess’ therapy sessions to life could be one reason for that. Another could be the newness of acting with the game that almost becomes a character rather than a special effect. Burttram gives a fierce performance. Her portrayal of Jess’ painful and slow recovery often makes the audience collectively cringe. The actress also lets theatergoers glimpse her emotional vulnerability in the scenes with her former boyfriend, Stevie. It is Burttram’s interaction with the virtual reality game that makes her performance unique. She treats the game as a living, breathing character. The audience experiences the game as Jess does because Buttram’s portrayal lets theatergoers experience it as the character does. As Jess’ sister, Kacie, Roeder gives a passionate performance equal to Burttram’s. The two women are convincing as sisters, with Roeder wearing Kacie’s burden of caring for a mother suffering from dementia and a physically damaged sister like a heavy millstone. LaBree’s Stevie is a charming doofus who wants to be supportive of Jess but is unsure of how to do that, in part, because he’s married. LaBree and Burttram are convincing ex-lovers. Their initial awkwardness evolves into a gentle tenderness that seems natural. As Kelvin, Kacie’s boyfriend, Allen Adams is a sincere oaf. At first, their relationship seems as improbable as Jess believes it to be but Adams’ performance slowly reveals there’s more to Kelvin than what’s on the surface. It is a subtle and nuanced performance. Credit for the success of the show goes to game and projection designers Charles Carter and Brave Williams. The virtual world they created is majestically dazzling. It works well with the set, lighting and costumes, designed by Tricia Hobbs, Scout Hough and Kevin Koskie, respectively. Ushers told theatergoers before Saturday night’s opening performance that the show would run about 90 minutes without an intermission. A few audience members did not heed that warning and left their seats and returned during the performance. That is on par with talking loudly to a seatmate during a show. Both are equally rude and disrespectful to the performers. People who can’t make it through the show without getting up should skip a drink before the performance or stay home. “Ugly Lies the Bone” is not a perfect play but it approaches the subject of healing from injuries and coming home scarred by war from a different perspective than many shows that have come before. The innovative use of technology and the effort to make the audience see and experience what Jess does in therapy are worthy of theatergoers full attention for a mere 90 minutes.